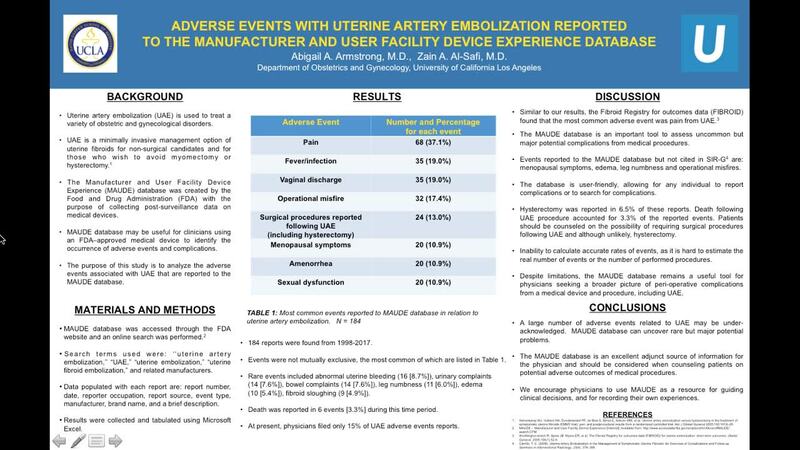 Analysis of Adverse Events with Uterine Artery Embolization Reported to the Manufacturer and User Facility Device Experience Database. OBJECTIVE: The Manufacturer and User Facility Device Experience (MAUDE) database may be useful for clinicians using a Food and Drug Administration-approved medical device to identify the occurrence of adverse events and complications. We sought to analyze and investigate reports associated with the uterine artery embolization used for treatment of fibroids using this database. DESIGN: Retrospective review of the MAUDE database for events related to uterine artery embolization. MATERIALS AND METHODS: The MAUDE database was accessed online, and searched for reported events related to uterine artery embolization from 1998-2017. These reports were reviewed and analyzed, events reported were categorized, and other relevant information were collected and tabulated. RESULTS: One hundred fifty-four adverse events were reported in the study period. Pain was the most frequently reported event (67 events [43.5%]), followed by vaginal discharge (35 events [22.7%]). Fever or infectious complications were reported in 33 events (21.4%). Hysterectomy was performed or scheduled in 19 of the reports (12.3%). Death following uterine artery embolization was reported in 6 accounts (3.9%). CONCLUSIONS: A variety of adverse events associated with the use of uterine artery embolization were reported to the MAUDE database related to its use for treatment of uterine fibroids. Hysterectomy was reported in 12% of these reports and death following this procedure was mentioned in about 4% of the reported events. We encourage physicians to review the MAUDE database when using medical devices, as it is an excellent tool to assess uncommon but major problems that could be associated with a medical device.